When I read my student’s words: “This class was a game-changer for me,” I nearly went into orbit. He now looked at transformation, life and even God differently than before. This is what I live for, I thought! I confess I love being a game-changer. I would reform the world if I could. Maybe you aren’t as enthusiastic about being a change agent, but isn’t there some rule or some class you’d like to change? Some lethargic group you’d like to energize? Some cultural practice you’d love to see overhauled? The problem with being game-changers is that we don’t rest well. We aren’t peaceful people. Sometimes we despair of life and become crabby. In fact, we struggle to trust God. Jesus was the ultimate game-changer. First, he offered the ultimate game: living each day in the kingdom of God here and now; living in union with God. (You and I also offer the same.) Second, his ideas were expressed through his deeply good but attractive life because he had that kind of character. My character isn’t there yet–especially that trusting peacefulness. 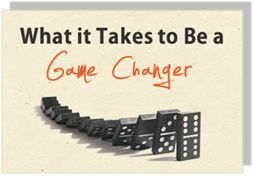 I have been working on this for years: to be a game-changer but not agitated about the current status of the game?!? Aim to be a gentle, healing influence. Cultivate this within. Stay light-years away from anything pushy or browbeating. Relax. Game-changing creates tension. Relaxing within that tension (and even being fun) can help others as well as myself. Do not expect others to change immediately, maybe not even soon. Sow seeds patiently. Know your job: My job is not to secure certain outcomes (i.e. change! ); my job is to be faithful in presenting ideas, but doing so with both skill and respect. Expect that anger about this situation might seize me. If so, process that frustration with God, praying for the situation and courage to be a gentle healer. Accept people as they are. Appreciate that they’ve come this far. Listen to others. I can learn insights from them about the game I so much want to change. Never obsess on what want needs changing. But when I do obsess anyway, admit it. I can accept this weakness in myself. God is the ultimate game-changer. But God is also patient and kind. I want to do that. Transformation into Christlikeness is as much “caught” as “taught,” which means we need to do more than read books about it. The Apprentice Experience is an opportunity to journey with others in community, interacting with others about life-changing ideas. This 18 month journey allows you to experience real people doing real life together in Christ. You’ll never be the same.